"This photograph was used for special friends of the Ford family who requested an autographed photograph of Liberty. Every so often I would have about ten to twelve photographs sent to my office where I would then arrange for Liberty to be brought to my office and we would do her autograph. The photographs would be attached to a hard cardboard backing and sometimes would be addressed using calligraphy to the individual or individuals requesting the photograph. When Liberty arrived in my office, I would clean her paw very carefully and then press her clean paw on an inked stamp pad and then press the inked paw on the cardboard backing. I would then proceed with the rest of the photographs I had received. I probably would not have done more than ten or twelve at any one time. When we had autographed all the photographs for that period, I would then again clean Liberty's paw quite thoroughly so she would not leave a trail of ink on the carpets. Liberty, who was a most gorgeous golden retriever, was always very gentle and patient while I did her autographs. She was a delight to work with and a pleasure to have around. She was also extremely friendly." 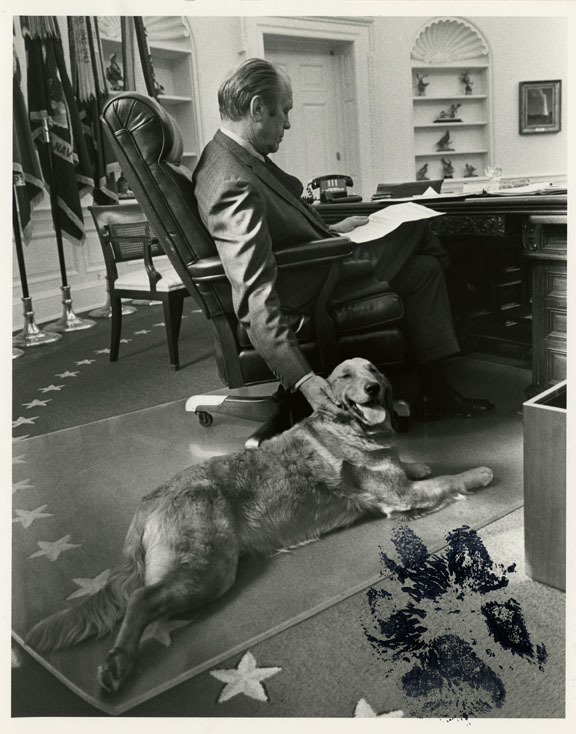 As news reports of these "paw-tographs" surfaced, many individuals wrote to the White House asking for them. 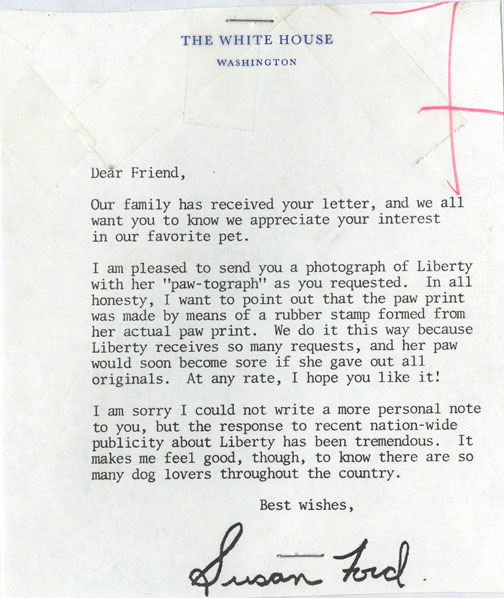 Eventually the White House staff made a copy of Liberty's pawprint, turned it into a rubber stamp, and began stamping her "autograph" onto photographs. The images below show the form letter used to answer these requests along with one of the stamped paw-tographed photographs.